ADS (A Dispatch Service, LLC ) has been in the Transportation/Logistics Industry for over 30 Years servicing Shippers across the U.S. & Canada. We handle truck loads and specialize in partial (LTL), and expedited services to all 48 states and Canada. We represent a wide range of carriers. A few are: Admiral Merchants, Jones Motor, American Transport, Cardinal Transportation, and Miller Transfer. 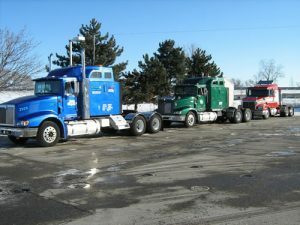 Our Equipment includes flatbeds, step-decks, conestogas, and vans. We also have specialized equipment for oversize and overweight shipments. All freight quotes are negotiable in order to provide optimal service for our customers. All freight quotes and invoices can be sent via email or fax. We take pride in keeping our rates competitive while providing excellent service. Approximately 70% of our business is LTL shipments which lowers your shipping cost and makes freight delivery timely. We look forward to being of service to you and your company’s transportation needs. Please feel free to contact us with any of your freight needs along with any questions or concerns you may have. What can we say about Kenneth Hayes? A lot! First of all, he was the best boss an employee could ever dream to have. He treated everyone with great respect. His moral compass was definitely pointed in the right direction. Everyone from the office personnel, truck drivers and the owner/operators of the big rigs were always given the benefit of the doubt. This carried over to all the clients that he had the opportunity to serve. Ken never shied away from his beliefs. Ken’s way of thinking and treating people rubbed off on each and every person that he crossed paths with throughout his life. His wife was honored to be married to such a man, and his children were privileged to have him as a father. Ken’s generosity to family, friends, and employees was exceptional, especially in their time of need. He was like no other person we have ever known, Ken always looked at the bright side of things, and he would often say “Everything will turn out okay.” He was usually right. Ken is with us every day; in our hearts and in our minds as we strive to live our lives, business and personal, by the great example he set. Continuing to lead A.D.S. with the same beliefs and teaching that were instilled by Ken Hayes is Brad Tolles. Brad was often mistaken as Ken’s son due to the fact that they were very close. Brad started in trucking at an early age going on long haul runs with his brother, when he probably should have been in class. He is open with people and dedicated to making sure the job is done right. As a result, he has gotten to know many clients and drivers personally over the years. Looking forward to building new relations and shipments to come!